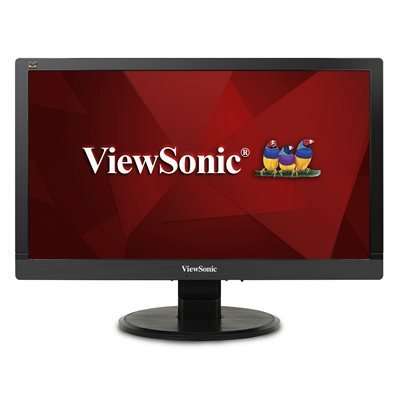 The ViewSonic VA2055Sm features a 20"Full HD SuperClear MVA widescreen panel with integrated dual 2W speakers. The monitor offers 1920x1080 resolution, 3,000:1 Contrast Ratio, VGA & DVI inputs, and a VESA-compatible mount design. In addition, Flicker-Free and Blue Light Filter technology help to eliminate eye strain from extended viewing periods. ViewSonic's exclusive ViewMode provides intuitive presets to deliver optimized screen performance in different applications. diagonal screen size 20 in. dimensions 11.3" x 18.6" x 1.9"
This monitor features Full HD 1920x1080 resolution for unbelievable pixel-by-pixel image performance. You’ll experience the most amazing clarity and detail whether it be while working, gaming, or enjoying the latest in multimedia entertainment. The ViewSonic® VA2055Sm features a 20” (19.5” viewable) Full HD SuperClear® MVA widescreen panel with integrated dual 2W speakers. The monitor offers 1920x1080 resolution, 3,000:1 Contrast Ratio, VGA & DVI inputs, and a VESA-compatible mount design. In addition, Flicker-Free and Blue Light Filter technology help to eliminate eye strain from extended viewing periods. ViewSonic’s exclusive ViewMode™ provides intuitive presets to deliver optimized screen performance in different applications. Lastly, with a 3-year limited warranty, one of the industry’s best pixel performance policies, ENERGY STAR and EPEAT certification, and an energy-saving Eco-mode, the VA2055Sm is a great long-term investment for any of your entertainment or professional needs. DVI and VGA inputs give you the freedom to connect your monitor to a variety of devices. With EPEAT Certification, this monitor delivers a reduced environmental impact over the complete product life cycle, making it a great eco-friendly, long-term investment. This is an ENERGY STAR certified product that can save up to 30%** on energy costs while reducing greenhouse gases.